Jo has gone from playing with her team, Scruples, in the Getin2… league, to embracing the opportunity to increase awareness of Rounders and the value it can bring to women and girls lives. 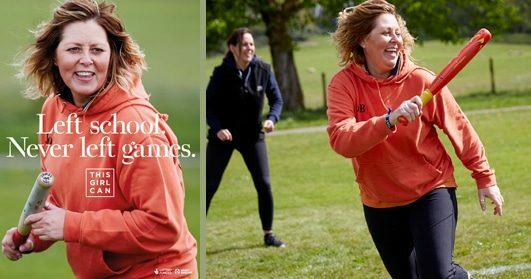 Shortly before becoming a Rounders England Board Member, January 2016 saw the launch of the This Girl Can active wear in 26 Marks & Spencer stores nationwide with Jo becoming the face of the retail campaign. To bring Jo’s love of Rounders to life, we commissioned the creation of two videos. We think these successfully portray what This Girl Can celebrates, and really brings to life what Rounders means to those people who love it, play it and are involved with the game. Playing Rounders I don’t want to have to worry about how good I am or what I look like when I play, but being able to wear the This Girl Can attitude with pride feels great!